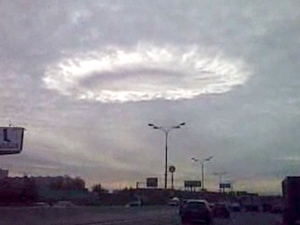 In "Mysterious Sky: Soviet UFO Phenomenon," Philip Mantle and I have described a number of cases involving strange, eerie clouds (all over the former USSR and modern Russia and the newly independent countries). Also, the sightings of cosmonauts of unusual cloud formations have been described in detail. "In the summer of 1990, a ship was harbored in the Ust-Belaya Village. Its crew noticed cumulus clouds that suddenly formed a perfect circle. In the center of the circle one could observe clear blue sky. "The watch officer, Aleksandr Polorotov, took pictures of the event unfolding before their eyes. Groups of aircraft exited the circle, and flew away, to disappear in the surrounding clouds. "The Soviet sailor, who previously served in the Air Force, knew the types of the aircraft of his country. The “aircraft” he observed in the Chukotka sky appeared nine times. Polorotov was able to take just several pictures before his camera malfunctioned. "When the film was developed, a cigar-shaped object could be seen on some of the photos. It had a strange luminescence, and some black dots were visible at a distance. But the mysterious “aircraft”, also observed by seven other crew members, were not on any of the photos. The Soviet crew members experienced the same side effects as the native hunter in 1989: general weakness and headaches."